Dr. Robert Prošek is a Diplomate of the American College of Veterinary Internal Medicine (ACVIM) and has also become a Diplomate of the European College of Veterinary Internal Medicine, Companion Animals (ECVIM-CA). He is board-certified in cardiology. His post DVM training started as an internship in small animal medicine and surgery at the University of Illinois followed by his cardiology residency training of three years. Dr. Prošek also pursued a master of science degree at the University of Illinois and received a degree in Veterinary Clinical Medicine. Special inteterests include all cardiovascular and respiratory topics especially echocardiography (ultrasound of the heart), novel medical and interventional therapies, blood based markers of heart disease and most importanly his patients. Dr. Prošek was a clinical assistant professor of cardiology at the University of Florida for four years, where he was responsible for resident, intern and student training. 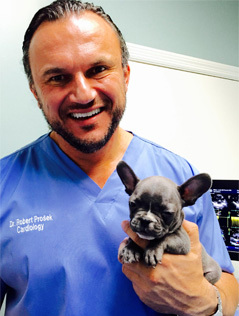 Dr Prošek still serves as an adjunct professor of cardiology at the University of Florida, and serves as the cardiologist for Zoo Miami. He is also a reviewer for the Journal of Veterinary Cardiology, Journal of the American Veterinary Medical Association, and the Journal of Veterinary Internal Medicine. Event Though all these activities keep him busy, he feels they are all very important as it allows him to stay well rounded which he hopes will translate into optimal high quality care for his patients. Prošek R. Abnormal heart sounds and heart murmurs (66). In: Ettinger SJ, Feldman EC (eds. ): Textbook of Veterinary Internal Medicine, 7th ed. WB Saunders, Philadelphia, 2010. Prošek R. Canine cardiomyopathy (38). In: Silverstein DC, Hopper K (eds.) Small Animal Critical Care Medicine, 1st ed. WB Saunders, St. Louis, 2009. Prošek R. Abnormal Heart Sounds and Heart Murmurs. In: Ettinger SJ, Feldman EC (eds. ): Textbook of Veterinary Internal Medicine, 6th ed. WB Saunders, Philadelphia, 2004; (55). Prošek R. Echocardiography. In: Cotté, E (ed.) Veterinary Clinical Advisor, 1st ed. WB Saunders, Philadelphia, 2006. Prošek R. Dilated Cardiomyopathy. In: Cotté, E (ed.) Veterinary Clinical Advisor, 1st ed. WB Saunders, Philadelphia, 2006. Prošek R. Electrical cardioversion of sustained ventricular tachycardia in three Boxers. J Am Vet Med Assoc. 2010 Mar 1;236(5):554-7. Seibert RL, Maisenbacher HW, Prošek R, Adin DB, Arsenault WG, Estrada AH. Successful closure of left to right patent ductus arteriosus in three dogs with concurrent pulmonary hypertension. J Vet Cardiol. 2010 Feb 2. Oyama MA, Rush JE, Rozanski EA, Fox PR, Reynolds CA, Gordon SG, Bulmer BJ, Lefbom BK, Brown BA, Lehmkuhl LB, Prošek R, Lesser MB, Kraus MS, Bossbaly MJ, Rapoport GS, Boileau JS. Assessment of serum N-terminal pro-B-type natriuretic peptide concentration for differentiation of congestive heart failure from primary respiratory tract disease as the cause of respiratory signs in dogs. J Am Vet Med Assoc. 2009 Dec 1;235(11):1319-25. Estrada AH, Maisenbacher HW, Prošek R, et al.Evaluation of pacing site in dogs with naturally occurring complete heart block. J Vet Cardiol. 2009 Dec;11(2):79-88. Shih AC, Maisenbacher HW, Barreirinha A, Adin DB, Schmidt MK, Prošek R, Estrada AH. Effect of routine cardiovascular catheterization on cardiac troponin I concentrations in dogs. J Vet Cardiol. 2009 May;11. Schmidt MK, Reynolds CA, Estrada AH, Prošek R, Maisenbacher HW, Sleeper MM, Oyama MA. Effect of azotemia on serum N-terminal proBNP concentration in dogs with normal cardiac function: a pilot study. J Vet Cardiol. 2009 May;11 Suppl 1:S81-6. Maisenbacher HW, Estrada AH, Prošek R, et al. Evaluation of the effects of transvenous pacing site on left ventricular function and synchrony in healthy anesthetized dogs.Am J Vet Res. 2009 Apr;70(4):455-63. Schmidt M. Estrada A, Vangilder J, Maisenbacher H, Prošek R. Safety and feasibility of transesophageal pacing in a dog. J Am Anim Hosp Assoc. 2008 Jan-Feb;44(1):19-24. Oyama MA, Sisson DD, Prošek R, et al. Carvedilol in dogs with dilated cardiomyopathy: results of a prospective, placebo-controlled, randomized clinical trial. J Vet Intern Med. 2007 Nov-Dec;21(6):1272-9. Prošek R, Sisson DD, Oyama, MA, Solter PF. Distinguishing Cardiac and Non-cardiac Dyspnea in 48 Dogs via Plasma Atrial Natriuretic Factor, B-type Natriuretic Factor, Endothelin and Cardiac Troponin-I. J Vet Intern Med2007;21:238-242. Adin DB, Maisenbacher HW, Ojeda N, Fiorello CV, Estrada AH, Prošek R, Citino SB. Cardiac evaluation of anesthetized Grevy’s zebras (Equus grevyi). Am J Vet Res. 2007 Feb;68(2):148-52. Oyama MA, Prošek R. Acute conversion of atrial fibrillation in two dogs by intravenous amiodarone administration. J Vet Intern Med. 2006 Sep-Oct;20(5):1224-7. Lopes R, Solter PF, Sisson DD, Oyama MA, Prošek R. Correlation of mitochondrial protein expression in complexes I to V with natural and induced forms of canine idiopathic dilated cardiomyopathy. Am J Vet Res. 2006 Jun;67(6):971-7. Lopes R, Solter PF, Sisson DD, Oyama MA, Prošek R. Characterization of canine mitochondrial protein expression in natural and induced forms of idiopathic dilated cardiomyopathy. Am J Vet Res. 2006 Jun;67(6):963-70. Prošek R, Sisson DD, Oyama MA, et. al. Plasma endothelin-1 immunoreactivity in normal dogs and dogs with acquired heart disease. Vet Intern Med. 2004 Nov-Dec;18(6):840-4. Prošek R, Sisson DD, Bulmer BJ, Oyama MA. ECG of the month. Complete AV block, and lack of capture (pacing) of the ventricles by the single-lead atrial-sensing VDD system J Am Vet Med Assoc. 2004 Sep 15;225(6):845-6. Prošek R, Sisson DD, Oyama MA. Runaway Pacemaker in a Dog. J Vet Intern Med. 2004 Mar-Apr;18(2):242-4. Prošek R, Sisson DD, Oyama MA, et. al. Measurements of Plasma Endothelin Immunoreactivity in Healthy Cats and Cats with Cardiomyopathy. J Vet Intern Med.2004 Nov-Dec;18(6):826-30. Senello KA, Schulman RL, Prošek R, Siegel AM. Systolic Blood Pressure in Cats with Diabetes Mellitus. J Am Vet Med Assoc 2003; 223 (2): 198-201. Prošek R, Sisson DD, Oyama MA. What is your diagnosis? Pericardial effusion with a clot in the pericardial space likely caused by left atrial rupture secondary to mitral regurgitation. J Am Vet Med Assoc 2003; 222(4): 441-442. Prošek R, Kitchell BE. Pharm Profile: Dexrazoxane. Compend Contin Educ Pract Vet 2002; 24(3): 220-222. Prošek R, Pechman RD, Taboada J. Using Radiographs to Diagnose the Cause of Vomiting in a Dog. Vet Med 2000; September: 688-690. Prošek R, Strickland KN. Clinical Snapshot: Left Atrial Thrombus. Compend Contin Educ Pract Vet 2000; February:145 &187. Shih A, Adin D, Estrada AH, Maisenbacher H,Prošek R. Cardiac Troponin I Concentrations During and after Routine Cardiac Catherization in Dogs. American College of Veterinary Internal Medicine 25th Forum, Seattle,Washington June 2007. HW Maisenbacher, AH Estrada, R Prošek, AC Shih, JM VanGilder, MA Powell, MD Campbell. Evaluation of Transvenous Pacing Site on Left Ventricular Function and Syncrony in Healthy Anesthetized dogs., American College of Veterinary Internal Medicine 25th Forum Seattle, Washington, June 2007. Estrada AH, Maisenbacher HW, Prošek R, VanGilder J, Powell M. Feasability of Biventricular Pacing in Dogs with Complete Heart Block, 16th European College of Veterinary Internal Medicine Congress, Amsterdam, The Netherlands, September 2006. Prošek R, Estrada AH, Adin D. Comparison of sotalol and mexiletine versus stand alone sotalol in treatment of Boxer dogs with ventricular arrhythmias. American College of Veterinary Internal Medicine 24th Forum, Lexington,Kentucky, June, 2006. Maisenbacher HW, Estrada AE, Prošek R and Paolillo JA. A doggone day in the cath lab: collaboration between pediatric and veterinary cardiologists in canines with congenital heart disease. 4th World Congress of Pediatric Cardiology and Cardiac Surgery, Buenos Aires, Argentina 2005. Prošek R, Sisson DD, Oyama, MA, Solter PF. Distinguishing Cardiac and Non-cardiac Dyspnea in 48 Dogs via Plasma Atrial Natriuretic Factor, B-type Natriuretic Factor, Endothelin and Cardiac Troponin-I. J Vet Intern Med2004 abstract. Prošek R, Sisson DD, Oyama MA, Biondo AW, Solter PF. Plasma Endothelin-1 Concentrations in Healthy Dogs and Dogs with Acquired Heart Disease. J Vet Intern Med 2004 abstract. Prošek R, Sisson DD, Oyama MA, Biondo AW, Solter PF. Endothelin-1 Plasma Immunoreactivity in Cats with Myocardial Disease. J Vet Intern Med 2003; abstract #71,396-397. Oyama MA, Prošek R, Sisson DD. Effect of Amlodipine on the Severity of Mitral Regurgitation in Dogs with Chronic Mitral Valve Disease. JVIM 2003; 17(3) abstract #82, 399-400. Oyama MA, Solter PF, Prošek R, Ostapkowicz RR, Sisson DD. Cardiac Troponin-I Levels in Dogs and Cats with Cardiac Disease. JVIM 2003; 17(3) abstract #83, 400. Estrada AH, Prošek R, Mainsenbacher HW, Adin D, VanGilder J, Valverde J. Morris Animal Fund grant (MAF Project Number: D05CA-309); Comparative effect of pacing sites in dogs with complete heart block (2006): $100,000.